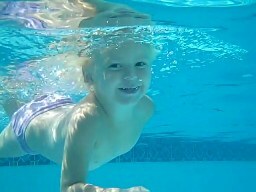 Alivia, age 4, enjoys swimming with her family and friends. All children not fully potty-trained for at least 3 months must wear either a swim diaper or rubber pants under their swimsuit. Not the paper "Huggies" Little Swimmers. These students can be changed poolside. Older children can arrive in their bathing suit. Please bring dry clothes for your child to change into after lessons. Please bring 3 towels to lessons every day. Your child will lie on two towels and cover up with/dry off with the third.